Architect Fred Mason (pointing) and the other critics were intrigued by Brooks Backinoff's tree stump concept, aimed to create an interactive space where children could learn about nature. Ali Emara presents his log cabin design. 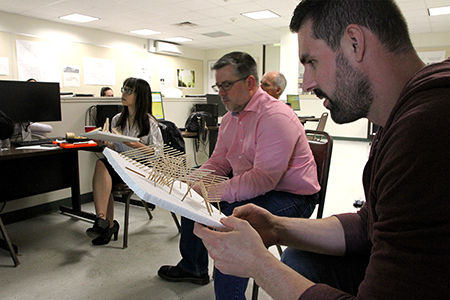 From left, judges Rebecca Morales, Fred Mason and Dom Rodriguez examine students' models. Seated, from left, Architecture students Meghna Vanburkar, Matthew Scharff (graduating), and Ashly Monterroso-Herrera; standing, from left, alum and critic Dom Rodriguez, alum and critic Fred Mason, Professor Garry Perryman, Adjunct Professor Sabrina Dequevedo, students Brooks Backinoff and Ronaldo, Desiderio, alum and current NJIT student Rebecca Morales, and student Ali Emara. Matthew Scharff at work in the computer lab a week prior to the presentations. West Windsor, N.J. – The assignment sounds simple enough: Create a nature center for a Princeton park. But then the questions arise. What is the building’s main purpose? How should a human-made structure best be incorporated into a natural, woody setting? What materials should be used? What age group should it appeal to most? And, how will the structure look and function ten years from now? 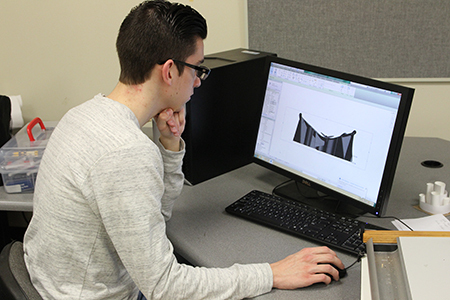 Architecture students at Mercer County Community College (MCCC) tackled these questions and more, testing both their critical thinking and design skills in a project that spanned most of the semester in their Architecture Design II course with Professor Garry Perryman. 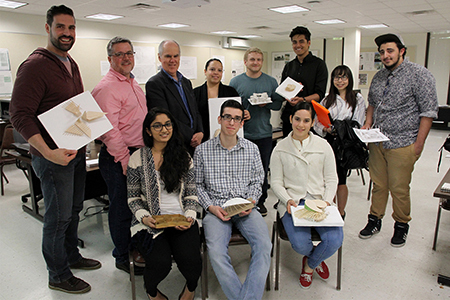 Students explained their concepts and presented their handmade and computer-based models before a panel of architects as their final assignment in May. Three MCCC Architecture alumni served as the client: architect and entrepreneur Dominick Rodriguez ’05; architect Fred Mason, and Rebecca Morales ’16, a current student at the New Jersey Institute of Technology. Students had no shortage of creative ideas and approaches. One student designed his structure to look like a log cabin, while another focused on the use of green building techniques and materials. A third created an interactive tree stump, and a fourth designed separate buildings connected by bridges. Rodriguez, a former MCCC adjunct instructor, suggested to students that they plan their projects in sections. “Take an abstract concept and give it form,” he said, adding that sometimes model-building works better than the use of computer-aided design (CAD). 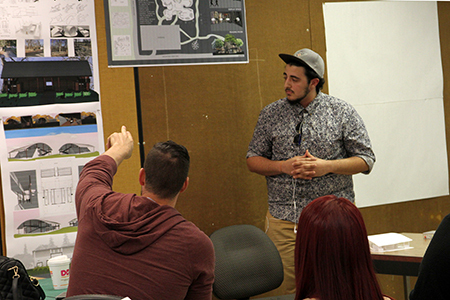 Rodriguez, who completed his bachelor’s and master’s degrees at the New Jersey institute of Technology, has been back to campus numerous times to critique students’ work. 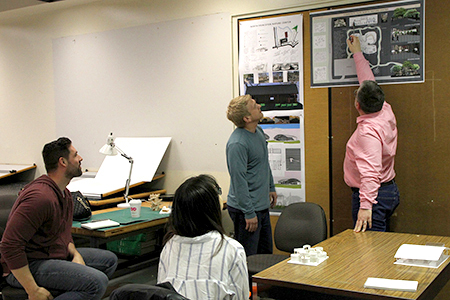 “It’s good for students to hear from architects in the field,” he said.